Dogs love to fetch toys, and these days dog toys come in many different shapes and sizes. FetchPro is a patented tool ( US patent #US9585367B2) designed to pick up and throw any toy ranging from 1 inch in diameter to 6 inches in diameter. Tennis ball launchers are great at throwing tennis balls, but they really only work on tennis balls or toys that are tennis ball size and shape. If you go to a pet store, the majority of dog toys are not tennis ball size and shape, and these toys do not work with regular tennis ball launchers. 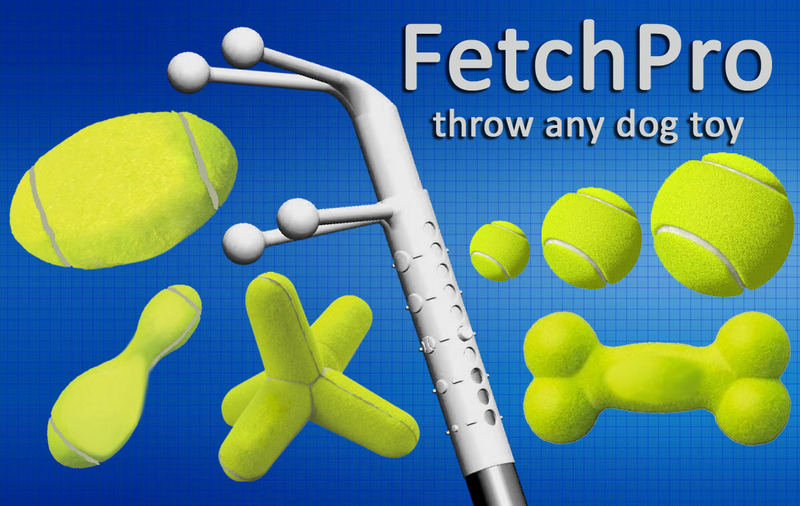 With FetchPro’s patented design ( Us patent #US9585367B2), you can pick up and throw any dog toy ranging from 1 inch in diameter to 6 inches in diameter. Fetch pro has a low production cost per unit, is extremely light and compact for shipping and shelf space, thoroughly field tested, and ready for mass production.